Mandevilla are a popular climbing plant with very colourful flowers. Generally it is the cultivars offered by wholesale growers in pots with temporary climbing frames. They do require a position in full sun to afternoon shade and are suited to growing over pergolas as well as other structures. Good deep green glossy foliage and a free flowering habit make these attractive plants for many gardeners. Available in a range of colours from white through pinks, red and to a mid burgundy depending on the grower. 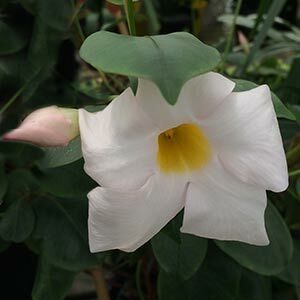 The well known and very popular Mandevilla ‘Alice Du Pont’ and other Mandevilla species are available from participating growers. A few compact growing types that grow as a low shrub and require little staking are also available. Growing well in many areas of Australia they do require protection from frost and are best grown from Sydney through to North Queensland as well as in Perth. In colder areas a sunny protected position will usually see satisfactory growth and good flowering. Many fine examples can be found in protected positions in Melbourne and Adelaide. Some cultivars have tendrils, others do not. Prune in late winter after the danger of frost is over.